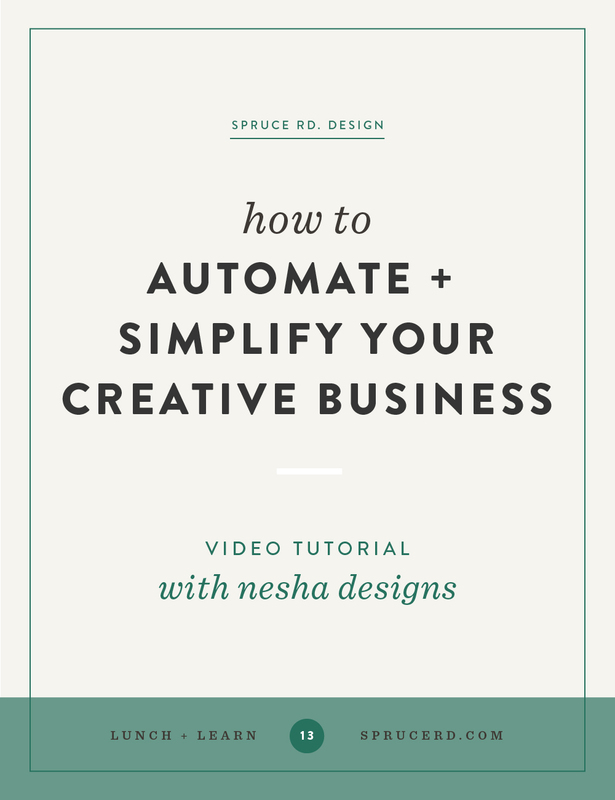 How to Automate + Simplify your Creative Business — Spruce Rd. Last week we had the pleasure of hearing from Nesha, of Nesha Designs, and her thorough + actionable tips on how to simplify your business. Nesha has continuously impressed me with her organized client process, social media management and automation techniques. I walked away taking action on a few of her tips already! (hello blog to newsletter RSS draft!). Below is the video to the workshop recording + a few notes. Tune into the recording to view even more tips from Nesha! Why simplify & automate your business? Creative entrepreneurs only have so many hours in the day, yet we expect ourselves to complete so many tasks. Have you ever felt frustrated because you haven't crossed off every task on your to do list for the day? Have you ever felt unproductive because you only completed 80% of the things you needed to do? Have you ever looked at the creatives around you and wondered how the heck they go SO much done? It's difficult not to be hard on ourselves. A lot of pressure comes with being a solopreneur. But we don't have to do All The Things. If we automate some of the small tasks that pile up, we can save ourselves time and stress. Enjoying more time with our family and friends. Spending more time creating a variety of income streams. Taking our time to create the best work possible for our clients. Taking time out for exercise and wellbeing. These are all things that small business owners easily overlook, but read through them again: wouldn’t you say they’re among the biggest priorities in our lives? Take one hour out today to implement the automation tips from the workshop (video below). If you don’t have a spare hour, try out these five tips instead! 1. Turn blog posts into newsletters. Do you manually paste your blog posts into newsletters and hit send? There was a time when I did that, too. But if you use Mailchimp or Convertkit, there’s no need! You can very easily automate this process so that Mailchimp sends your blog posts as newsletters without to having to even log in. If you’re on Convertkit, you can set up an automation that turns your blog posts into newsletters drafts that are ready and waiting for you to simply hit send. 2. Feedback reminders for clients. Create a project in Basecamp. In the To Do Lists section, create to do’s for their feedback. Set a due date for their feedback. When their feedback is due, Basecamp will send them a notification! Do you spend a lot of time telling your clients the same things? To avoid typing out the same answers to every client on every project, create a Welcome Packet. A Welcome Packet is a PDF (or page on your website) you send your clients at the start of their projects. It contains information like: guidelines for giving you valuable feedback, your office hours, the files you need from them before you can begin their project etc. I used to manually send my clients an email reminder an hour before their Skype session with me so they wouldn’t forget, but not anymore. My favorite tool for scheduling meetings is Calendly. Their $10 per month plan includes email reminders, so you never have to manually remind your clients of their session with you again! Reminding clients their payment is due or overdue can be awkward. There’s also a chance you’ll forget, or you’ll feel squirmish about talking money and you’ll send an overly polite reminder to overdue clients. To avoid painful money conversations and appear more professional (win win!) all you have to do is set up payment reminders. If you use Freshbooks or Pancake App, they will automatically remind your clients when their payments are coming up and they will continue to message the clients if the payment goes overdue. Watch the video above to see all tips for automating + simplifying your creative business! Nesha has some great tips to share, you won't want to miss out.